National Memorial Cemetery of the Pacific. 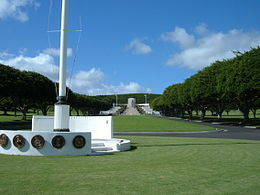 The National Memorial Cemetery of the Pacific occupies much of Punchbowl Crater. The memorial contains a small chapel and tribute to the various battles fought in the Pacific. The walls of the memorial are etched with names of those who were never recovered from battle. As of 1951, all the graves are marked with flat granite headstones. In February 1948, Congress approved funding and construction began on the national cemetery. Since the cemetery was dedicated on September 2, 1949, approximately 53,000 World War I, World War II, Korean War, and Vietnam War veterans and their dependents have been interred. The cemetery now almost exclusively accepts cremated remains for above-ground placement in columbaria; casketed and cremated remains of eligible family members of those already interred there may, however, be considered for burial. Prior to the opening of the cemetery for the recently deceased, the remains of soldiers from locations around the Pacific Theater—including Guam, Wake Island, and Japanese POW camps—were transported to Hawaii for final interment. The first interment was made January 4, 1949. The cemetery opened to the public on July 19, 1949, with services for five war dead: an unknown serviceman, two Marines, an Army lieutenant and one noted civilian war correspondent Ernie Pyle. Initially, the graves at National Memorial Cemetery of the Pacific were marked with white wooden crosses and Stars of David—like the American cemeteries abroad—in preparation for the dedication ceremony on the fourth anniversary of V-J Day. Eventually, over 13,000 soldiers and sailors who died during World War II would be laid to rest in the Punchbowl. Despite the Army's extensive efforts to inform the public that the star- and cross-shaped grave markers were only temporary, an outcry arose in 1951 when permanent flat granite markers replaced them. The National Memorial Cemetery of the Pacific was the first such cemetery to install Bicentennial Medal of Honor headstones, the medal insignia being defined in gold leaf. On May 11, 1976, a total of 23 of these were placed on the graves of medal recipients, all but one of whom were killed in action. In August 2001, about 70 generic "Unknown" markers for the graves of men known to have died during the attack on Pearl Harbor were replaced with markers that included USS Arizona after it was determined they perished on this vessel. In addition, new information that identified grave locations of 175 men whose graves were previously marked as "Unknown" resulted in the installation of new markers in October 2002. The National Memorial Cemetery of the Pacific contains a "Memorial Walk" that is lined with a variety of memorial markers from various organizations and governments that honor America's veterans. As of 2012, there were 60 memorial boulders (bearing bronze plaques) along the pathway. Additional memorials can be found throughout the National Memorial Cemetery of the Pacific—most commemorating soldiers of 20th-century wars, including those killed at Pearl Harbor. After their retreat in 1950, dead Soldiers and Marines were buried at a temporary military cemetery near Hungnam, North Korea. During Operation Glory, which occurred from July to November 1954, the dead of each side were exchanged; remains of 4,167 US soldiers/Marines were exchanged for 13,528 North Korean/Chinese dead. In addition 546 civilians who died in United Nations prisoner of war camps were turned over to the South Korean Government. After "Operation Glory" 416 Korean War "unknowns" were buried in the Punchbowl Cemetery. According to one report, 1,394 names were also transmitted during "Operation Glory" from the Chinese and North Koreans (of which 858 names proved to be correct); of the 4,167 returned remains were found to be 4,219 individuals of whom 2,944 were found to be Americans of whom all but 416 were identified by name. Of 239 Korean War unaccounted for: 186 not associated with Punchbowl unknowns (176 were identified and of the remaining 10 cases four were non-Americans of Asiatic descent; one was British; three were identified and two cases unconfirmed). Fifty-seven years after the Korean War, remains of two of the "Punchbowl unknowns" were identified—both from the 1st Marine Division. One was Pfc. Donald Morris Walker of Support Company/1st Service Battalion/1st Marine Division who was KIA December 7, 1950 and the other was Pfc. Carl West of Weapons Company/1st Battalion/7th Regiment/1st Marine Division who was KIA December 10, 1950. In 2011 remains of an unknown USAF pilot from Operation Glory were identified from the "Punchbowl Cemetery"; POW remains from "Operation Glory" were also identified in 2011. From 1990 to 1994, North Korea excavated and turned over 208 sets of remains—possibly containing remains of 200–400 US Servicemen—but few identifiable because of co-mingling of remains. In 2011 remains were identified. From 1996 to 2006, 220 remains were recovered near the Chinese border. In 2008, a total of 63 were identified (26 World War II; 19 Korea; 18 Vietnam) (Among those identified: January 2008 remains of a Michigan soldier. In March 2008, remains of an Indiana soldier and an Ohio soldier were identified). According to a report June 24, 2008, of 10 Korean War Remains disinterred from the "Punchbowl Cemetery" six have been identified. From January to April 2009, a total of twelve Unknowns have been identified—three from World War II; eight from Korean War; one from Vietnam. In 2011 remains returned in 2000 were identified. In 1964, the American Battle Monuments Commission erected the Honolulu Memorial at the National Memorial Cemetery "to honor the sacrifices and achievements of American Armed Forces in the Pacific during World War II and in the Korean War". The memorial was later expanded in 1980 to include the Vietnam War. The names of 28,788 military personnel who are missing in action or were lost or buried at sea in the Pacific during these conflicts are listed on marble slabs in ten Courts of the Missing which flank the Memorial's grand stone staircase. The statue is featured in the opening sequence of both the 1970s television series Hawaii Five-O and its 2010 remake. 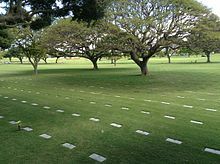 The latter series has also filmed at the cemetery several times — John McGarrett, the father of lead character, Steve McGarrett, is a Vietnam War veteran and is buried there. John "Jack" Chevigny (1906–1945), Notre Dame football player (said, "that's one for the Gipper" in 1928 game) who was killed on Iwo Jima. ^ "Korean War Exchange of Dead – Operation GLORY". Qmmuseum.lee.army.mil. Retrieved 2013-11-13. ^ "Korean War POW/MIA Network Operation Glory". Koreanwarpowmia.net. Retrieved 2013-10-25. ^ thedrifter08-27-07, 08:17 AM. "(August 2007)". Leatherneck.com. Retrieved 2013-11-13. ^ "DPMO news release" (PDF). Retrieved 2013-11-13. ^ "JPAC – Wars And Conflicts". Jpac.pacom.mil. July 29, 2008. Archived from the original on November 11, 2013. Retrieved November 13, 2013. ^ "Remains from Korea identified as Indiana soldier – Army News, opinions, editorials, news from Iraq, photos, reports – Army Times". Armytimes.com. Retrieved 2013-11-13. ^ Burbridge, Wendie (2015-06-27). "Five-0 Redux: On location in Hawaiʻi". Honolulu Pulse. Retrieved 2018-06-30. ^ "ABC-KITV News "Funeral services set for Sen. Inouye; viewing at U.S. Capitol followed by national then local services". Kitv.com. December 18, 2012. Archived from the original on November 13, 2013. Retrieved November 13, 2013. Sledge, Michael (2005). Soldier Dead: How We Recover, Identify, Bury, and Honor Our Military Fallen. Columbia University Press. ISBN 0-231-13514-9. OCLC 81452881. Wikimedia Commons has media related to National Memorial Cemetery of the Pacific. "Honolulu Memorial, National Memorial Cemetery of the Pacific" (PDF). American Battle Monuments Commission Honolulu Memorial. Archived from the original (PDF) on September 23, 2006. Retrieved December 2, 2006.